If you ever get a chance to go to the children’s area of the Takino Suzuran Hillside National Park in Sapporo, Japan then you’ll immediately notice a very cool, colorful landscape of crochet netting that kids can play on. This is the most famous work of textile artist Toshiko Horiuchi-MacAdam, the Rainbow Net. Toshiko Horiuchi-MacAdam received her Bachelor’s Degree of Fine Art from Tama Art University in Tokyo, Japan in 1964. She then moved to the United States to get her Master of Fine Arts from Michigan’s Cranbrook Academy of Art. She began her textile career in 1966 as a designer at Boris Kroll Fabric Company in New York. From there she went on to jobs in design as well as instruction in both fabric design and weaving. She continued her own art throughout this time. Her first major exhibit was an art wall hanging in 1968 at New York’s Museum of Modern Art. In 1979 she made her first knotted / crocheted children’s sculptural playground piece for the Marine Expo Memorial Park in Okinawa. She has since created numerous interactive children’s sculptures for various parks throughout Japan and has become widely known for this aspect of her art. She is currently based in Canada. 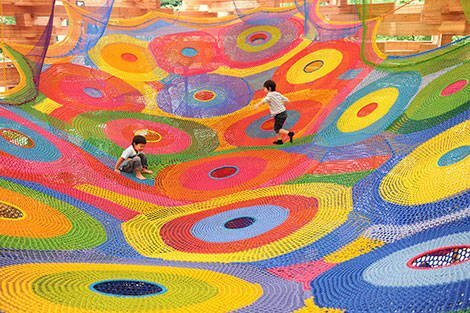 This crochet artist crochets colorful yarn into large scale nets that can be installed on playgrounds for children to climb upon. They are also visually stimulating, changing the landscape with their bold design. She starts the design process by creating a wooden scaled model of the public space that she’s going to place her net in and then crocheting the piece in fine cotton thread to the appropriate scale to match the wooden model. This then has to be adapted into a large scale piece using yarn and of course there are sometimes changes that must be made since yarn and thread can behave differently from one another. Playscapes, which is a fun blog all about playground design, recently had an article on this artist through which I learned the fun story about how she got started doing her large scale crochet playground pieces. They explained that the artist had her work in a gallery and a couple of kids came and started playing on her piece because they didn’t know any better. She loved the way that the sculpture came to life as these kids played on it and thus was born her desire to move her art into the public space where it could be used. When Toshiko Horiuchi-MacAdam orders her yarn for these projects, she has to order it by the ton, literally! In the end stages of actually making the pieces, Toshiko Horiuchi-MacAdam may crochet up to ten hours per day. Her major piece, the Rainbow Net, took three years to complete and was worked in collaboration with landscape designers and architects. Thanks @artlikebread … It was so fun to research and put together! ps Had to share and pin it! Thanks @Trudi … I love to see word about her work spreading. 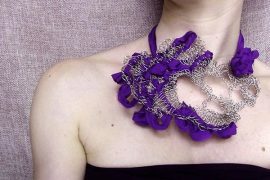 Stunning examples of crochet! Thank you for sharing! Thanks @Martha … This was definitely one of my favorite crochet artist profiles to research and write up! Absolutely gorgeous! Very inspiring and now I have to find a coffee book with these amazing images! Thanks so much. Thanks @Auntiebeckys … This one was so much fun to research and share. 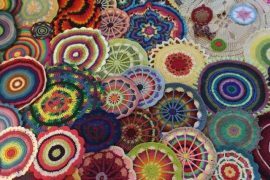 Since you mentioned coffee table books, I thought I’d share that another crochet artist, Mandy Greer, recently put out a stunning coffee table book of her ten year retrospective of works. It’s a different style that what Toshiko Horiuchi-MacAdam is doing but definitely beautiful in its own right. Wow! This is just so amazing! Who thought of this wonderful idea? Any jobs available? I’d happily spend all day crocheting. I would love it if there were a job that were available to do this. Not only would I apply for it but I’d be sure to mention it in my daily crochet job leads since I know many people would consider this a dream job! @FeliciaBelairRigdon Thanks! This one was so fun to research! You are AWESOME! This is so amazing. I bet the children love playing there! My name is Janet Figueroa Ugarte. 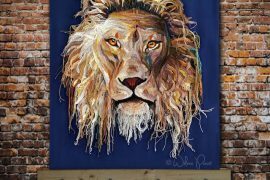 I am a Chilean artist, I create knitted wall murals. I have researched your work and I was very impressed by your reputation and career. I present this letter to you, to find out about copyright and intellectual property in your work. approval. And considering all legal and formal aspects related to this.